Open angle glaucoma (OAG) is a multifactorial optic neuropathy characterized by progressive retinal ganglion cell death and characteristic visual field pattern loss. Glaucoma is an increasingly important cause of blindness as the world's population ages. Statistics gathered by the World Health Organization (WHO) in 2002 showed that glaucoma is the second leading cause of blindness worldwide, after cataracts. However, glaucoma presents a greater public health challenge because the blindness it causes is often progressive and irreversible. In the United States alone, glaucoma has been diagnosed in more than 2 million people, who are at risk of becoming blind. Therefore, extensive research into the pathophysiology and understanding of glaucoma is underway to help guide pharmacologic and surgical interventions to slow this progressive optic neuropathy. Elevated intraocular pressure (IOP) has been identified as a major risk factor for OAG, and current treatment aims focus on reducing and controlling IOP to limit disease progression. Although additional risk factors for glaucoma have been identified, current treatments for decreasing IOP focus on either reducing the production of aqueous humor from the ciliary processes or on increasing the ability of the aqueous humor to drain from the eye. Treatments include the use of topical and oral pharmacologic agents to inhibit the production of aqueous humor or to help with the outflow of aqueous humor along the uveoscleral pathway. In addition, laser trabeculoplasty procedures have been designed to help open the trabecular meshwork to aid the outflow of anterior chamber fluid. Other procedures have focused on destruction of the ciliary processes that produce aqueous humor. However, use of daily topical medications creates a burden for patients, and studies have reported a very low compliance rate in patients using daily drops. Furthermore, patients often have variable responses to topical medications and laser treatments, and these treatment effects are often limited and ineffective at controlling IOP over many years. As a result of this, incisional surgical techniques have been designed to increase the drainage of aqueous humor in patients unresponsive to or noncompliant with topical therapy. These techniques include implanting artificial drainage valves (tube shunts) and surgically cutting additional passageways to drain the fluid (trabeculectomy/filter surgery). Risks associated with these surgical procedures include infection, cataracts, bleeding, hypotony, and filtration failure. In 1857, von Graefe found that removing a large piece of the iris helped many patients with glaucoma. Von Graefe's early work on this subject was translated into English and published by the New Sydenham Society in 1859. Eserine eye drops, made from the Calabar bean, were used before iridectomy to produce a miosis so that the iridectomy could be done peripherally in the iris. Occasionally, patients with glaucoma seemed better after using the eserine eye drops, so surgery was not needed. Von Graefe also suggested that patients undergo a visual field examination in the office. Toward the end of the 19th century, glaucoma was considered to be identical to elevated IOP (and vice versa). Low-tension glaucoma, by definition, did not exist. In 1909, Elliot, who was working at the Government Ophthalmic Hospital in Madras, India, used a trephine to make an anterior sclerectomy under a conjunctival flap, coupled with a peripheral iridectomy, in the attempt to improve on the operation of Lagrange (in Bordeaux). When Elliot reported 50 cases in 1909, he did not know that Fergus (in Glasgow) and Holth (in Christiania) had recently reported similar findings. Elliot's first book, Sclero-corneal Trephining in the Operative Treatment of Glaucoma, appeared in 1913 after he completed 900 cases, and the procedure received worldwide publicity. Elliot participated in a discussion about glaucoma with Lagrange and Smith (the English-language glaucoma expert) at the International Congress of Medicine in London. Elliot then traveled to America, where he visited many ophthalmic centers and performed his operation 135 more times. Elliot's trephining procedure was more effective than iridectomy in treating patients with chronic glaucoma. For the next 40 years, his trephining procedure took its place beside Holth's iridencleisis as one of the most popular glaucoma operations. Elliot followed up his first book with annual progress summaries on glaucoma in the Ophthalmic Yearbooks of 1913-1916 and a short book, Glaucoma: A Handbook for the General Practitioner, in 1917. In 1918, he published Glaucoma: A Textbook for the Student of Ophthalmology; in 1922, the enlarged second edition of this book, now called Treatise on Glaucoma, was a significant contribution to ophthalmology, as it improved the quality of teaching about glaucoma and posed questions about the mechanisms of the disease process. Iridencleisis was eventually abandoned because of fear of sympathetic ophthalmia and postoperative complications of cyclodialysis. Variations of Elliot's trephining procedure are still in use; Scheie's thermal sclerectomy was popular for a while; and Cairns' trabeculectomy, developed in 1968, turned out to be another external filtering operation that worked well. The definition of glaucoma has evolved to include more than just increased IOP. Glaucoma is defined as "the final common pathway of a group of diseases with decreased retinal ganglion cell sensitivity and function, retinal ganglion cell death, optic nerve axonal loss and concurrent cup enlargement, incremental reduction in visual fields, and blindness. Most of these diseases either result in or are associated with increased IOP in their mid to late stages." Although this definition is complicated, it highlights the fact that the understanding of the various clinical manifestations of glaucoma is expanding. Despite additional risk factors having been identified, such as a decrease in retrobulbar ocular blood flow, reduction in the IOP remains the only modifiable risk factor proven to slow the progression of glaucoma. Glaucoma is typically associated with aging, and its frequency increases as people reach their sixth decade of life. The disease is estimated to affect 1-2% of the US population and an estimated 67 million people worldwide. Glaucoma is the second leading cause of blindness in Europeans and the leading cause of blindness in blacks. The frequency of glaucoma-filtering complications depends on the technique used: trabeculectomy without antimetabolites, 8.3-28%; trabeculectomy with 5-fluorouracil (5-FU), 2.6-18.7%; and trabeculectomy with mitomycin-C (MMC), 0-29%. 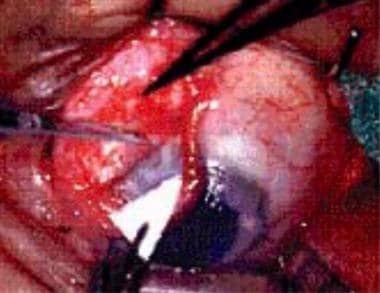 Eye that has undergone a trabeculectomy. The aqueous humor drains more easily after a small section of the trabecular meshwork was removed. Primary open angle glaucoma (POAG) is characterized by an elevated IOP at some point during the course of the disease with an open anterior chamber angle and a characteristic optic nerve and/or visual field change in the absence of concurrent ocular disease. Primary open-angle glaucoma, the most common form of glaucoma, is characterized by a chronic insidious onset. The exact etiology of POAG is not known, as glaucoma appears to be a multifactorial disease. POAG has been associated with increased intraocular pressure, decreased retrobulbar blood flow, hypertension, gender, race, and many other factors, providing further evidence that this disease is likely an overlap of many different elements. Additional population subsets within the spectrum of open angle glaucoma have recently been defined. For instance, normal tension glaucoma is defined as a progressive optic neuropathy, but with an IOP measuring less than 21 mm Hg. Furthermore, ocular hypertension has been defined as an IOP greater than 21 mm Hg, but with a normal anterior chamber angle and no optic nerve or visual field changes. Alternatively, individuals with primary glaucoma may have narrow-angle glaucoma, in which the iridocorneal angle progressively closes over time, resulting in obstruction of aqueous humor outflow. Iridocorneal angle. Structures of the angle are well recognized stereoscopically. From top to bottom: posterior surface of the cornea, Schwalbe line, nonpigmented trabecular meshwork, pigmented trabecular meshwork, scleral spur, ciliary body band, and iris root. Secondary glaucoma is characterized by elevated IOP associated with concurrent ocular disease. 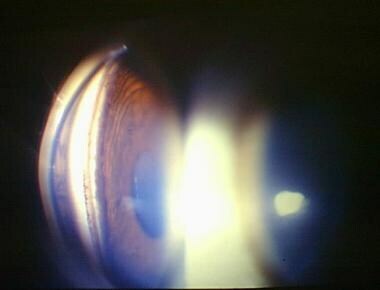 A few examples of secondary glaucoma causes include pigment dispersion and pseudoexfoliation syndrome, uveitis with the formation of peripheral anterior synechiae in the iridocorneal angle, intraocular hemorrhage with trabecular meshwork obstruction, intraocular neoplasia, and lens displacement, as is shown in the image below. Secondary glaucoma is characterized by elevated intraocular pressure associated with concurrent ocular disease, such as lens dislocation. Glaucoma is a group of ocular diseases characterized by progressive damage to the optic nerve. The disease is usually chronic and can lead to visual field loss and blindness. Cupping of the optic disc and loss of retinal nerve fibers indicate damage to the optic nerve. The loss of nerve fibers results in a corresponding patterns of visual field loss. Elevated IOP is a major risk factor for the development of POAG. The rate of aqueous humor production, the resistance in outflow routes, and episcleral venous pressure regulate IOP. Aqueous humor, produced by the ciliary processes, flows into the anterior chamber and leaves the eye by 2 pathways: trabecular (conventional) outflow and uveoscleral outflow. 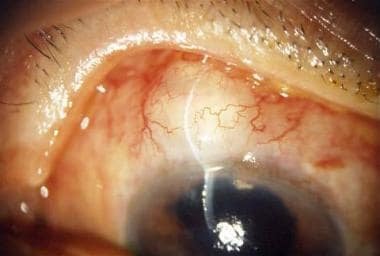 Most aqueous humor exits the eye through the trabecular meshwork, the Schlemm canal, and the episcleral veins; the remaining 10-20% exits via the uveoscleral route, passing between the ciliary muscle bundles. In a healthy eye, the production and outflow of aqueous humor maintain an IOP in the range of 10-21 mm Hg. Pressure is usually similar in both eyes and shows diurnal variations. In most patients with glaucoma, the resistance to aqueous humor outflow increases, resulting in elevated IOP. Glaucoma is categorized as open angle or closed angle. Open-angle glaucoma, the most common type, includes primary glaucoma, capsular glaucoma, pigmentary glaucoma, normal-tension glaucoma, and some types of congenital glaucoma and secondary glaucoma. Closed-angle glaucoma results from partial or total obstruction of the anterior chamber angle, which blocks the trabecular network. In primary open-angle glaucoma, elevated IOP likely results from low-grade obstruction of aqueous humor outflow in the trabecular meshwork. Elevated IOP, in turn, can produce mechanical and/or ischemic damage to the optic nerve. The onset is usually insidious and asymptomatic, with changes in the visual field not generally noticeable until late in the disease, when cupping of the optic disc can be seen. Patients with normal-tension glaucoma have pathologic optic disc cupping and visual field loss but normal IOP (< 21 mm Hg). In these patients, reducing IOP significantly delays glaucomatous changes. Normal tension glaucoma is thought to be related to ocular blood flow, as it has been associated with migraines, nocturnal hypotension, and a reduction in ocular perfusion pressure. Patients with ocular hypertension have elevated IOP (>21 mm Hg) but a normal visual field and optic disc. 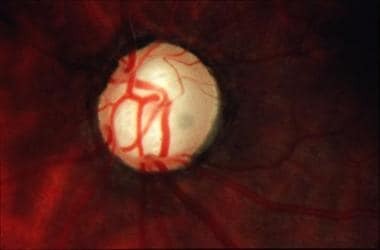 The relationship between ocular hypertension and glaucoma is not clear, but patients with ocular hypertension should be regularly monitored for visual field loss or changes in the optic nerve. The evaluation of patients with glaucoma is the single most important aspect of their initial care. Glaucoma specialists can perform more specialized examinations, such as Koeppe gonioscopy and tonography, as well as automated or manual perimetry, stereo disc photography, scanning laser imaging of the optic nerve (eg, optical coherence tomography [OCT], tests with a nerve fiber layer analyzer [NFLA]), and color Doppler imaging. Glaucoma is an optic neuropathy often associated with optic nerve abnormalities with structural excavation of the optic disc and functional changes in the visual field (eg, reduced peripheral visual field acuity, as is shown in the image below), often with elevated IOP. Reduced peripheral acuity in early glaucoma. Eyes with early glaucoma may have subtle structural and functional optic nerve changes, but it is very important to identify patients with glaucoma early in order to initiate therapy to limit injury to the nerve fibers. Clinical signs of late glaucoma often reveal extensive cupping of the optic disc due to the retinal ganglion cell injury and loss (as demonstrated in the image below). Cupping of the optic disc in late glaucoma. Critical factors for surgical interventions are individually based and depend on the amount of functional vision loss, the rapidity of visual deterioration, and the patient's life expectancy. The 2 primary types of disease, open-angle glaucoma and angle-closure glaucoma, are classified according to the anatomy of the anterior chamber angle and are shown in the image below. Open-angle glaucoma and angle-closure glaucoma are classified according to the anatomy of the anterior chamber angle, as determined on visual inspection of the angle by using a special lens. 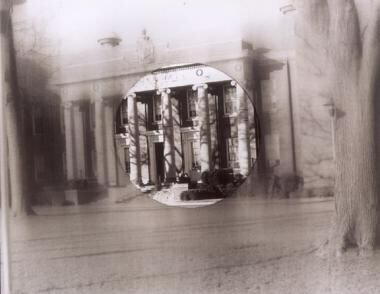 This image is seen through a 3-mirror gonioscope. 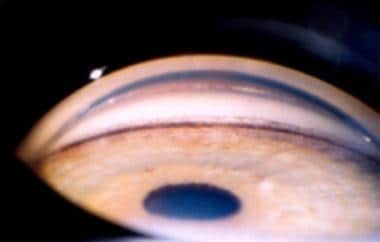 This classification is determined on visual inspection of the angle by using a special lens, called a goniolens, on the slit lamp biomicroscope. Patients with open-angle glaucoma can be treated with glaucoma-filtering surgery. Heijl A, Leske MC, Bengtsson B, Hyman L, Bengtsson B, Hussein M. Reduction of intraocular pressure and glaucoma progression: results from the Early Manifest Glaucoma Trial. Arch Ophthalmol. 2002. 120:1268–79. [Medline]. Cohn H. Indications for trabeculectomy in open angle glaucoma. Bull Soc Belge Ophtalmol. 1992. 244:155-60. [Medline]. [Guideline] AGIS Investigators. The advanced glaucoma intervention study (AGIS): 7. The relationship between control of intraocular pressure and visual field deterioration. Am J Ophthalmol. 2000 Oct. 130(4):429-40. [Medline]. Musch DC, Lichter PR, Guire KE, Standardi CL. The Collaborative Initial Glaucoma Treatment Study: study design, methods, and baseline characteristics of enrolled patients. Ophthalmology. 1999. 106(4):653-62. [Medline]. Weinreb RN, Zangwill L, Berry CC. Detection of glaucoma with scanning laser polarimetry. Arch Ophthalmol. 1998 Dec. 116(12):1583-9. [Medline]. Sacca S, Pascotto A, Siniscalchi C. Ocular complications of latanoprost in uveitic glaucoma: three case reports. J Ocul Pharmacol Ther. 2001 Apr. 17(2):107-13. [Medline]. Moradian K, Daneshvar R, Saffarian L, Esmaeeli H, Hosseinnezhad H. The efficacy of viscocanalostomy for uncontrollable primary open-angle glaucoma in a developing country. Indian J Ophthalmol. 2013 Feb. 61(2):71-3. [Medline]. [Full Text]. O'Brart DP, Shiew M, Edmunds B. A randomised, prospective study comparing trabeculectomy with viscocanalostomy with adjunctive antimetabolite usage for the management of open angle glaucoma uncontrolled by medical therapy. Br J Ophthalmol. 2004 Aug. 88(8):1012-7. [Medline]. Wamsley S, Moster MR, Rai S. Results of the use of the Ex-PRESS miniature glaucoma implant in technically challenging, advanced glaucoma cases: a clinical pilot study. Am J Ophthalmol. 2004 Dec. 138(6):1049-51. [Medline]. Jiraskova N, Rozsival P, Pozlerova J, Ludvikova M, Burova M. Expulsive hemorrhage after glaucoma filtering surgery. Biomed Pap Med Fac Univ Palacky Olomouc Czech Repub. 2009 Sep. 153(3):221-4. [Medline]. Costa VP, Smith M, Spaeth GL, et al. Loss of visual acuity after trabeculectomy. Ophthalmology. 1993 May. 100(5):599-612. [Medline]. Asrani SG, Wilensky JT. Management of bleb leaks after glaucoma filtering surgery. Use of autologous fibrin tissue glue as an alternative. Ophthalmology. 1996 Feb. 103(2):294-8. [Medline]. Ulrich GG, Proia AD, Shields MB. Clinicopathologic features and surgical management of dissecting glaucoma filtering blebs. Ophthalmic Surg Lasers. 1997 Feb. 28(2):151-5. [Medline]. Wang J, Harasymowycz P. Subconjunctival bevacizumab injection in glaucoma filtering surgery: a case control series. ISRN Ophthalmol. 2013. 2013:384134. [Medline]. [Full Text]. Freiberg FJ, Matlach J, Grehn F, Karl S, Klink T. Postoperative subconjunctival bevacizumab injection as an adjunct to 5-fluorouracil in the management of scarring after trabeculectomy. Clin Ophthalmol. 2013. 7:1211-7. [Medline]. [Full Text]. Bellows AR, Chylack LT Jr, Hutchinson BT. Choroidal detachment. Clinical manifestation, therapy and mechanism of formation. Ophthalmology. 1981 Nov. 88(11):1107-15. [Medline]. Dietlein TS. Perspectives in glaucoma surgery. Ophthalmologe. 2002 Feb. 99(2):74-84. [Medline]. Elliot RH. A Treatise on Glaucoma. New York: Hodder & Stoughton; 1922. Hamard P, Lachkar Y. Non penetrating filtering surgery, evolution and results. J Fr Ophtalmol. 2002 May. 25(5):527-36. [Medline]. Hirvela H, Laatikainen L. Visual acuity in a population aged 70 years or older; prevalence and causes of visual impairment. Acta Ophthalmol Scand. 1995 Apr. 73(2):99-104. [Medline]. Khalili MA, Diestelhorst M, Krieglstein GK. Long-term follow-up of 700 trabeculectomies. Klin Monatsbl Augenheilkd. 2000 Jul. 217(1):1-8; discussion 9. [Medline]. Negrel AD, Avognon Z, Minassian DC, et al. Blindness in Benin. Med Trop (Mars). 1995. 55(4 Pt 2):409-14. [Medline]. Nouri-Mahdavi K, Hoffman D, Gaasterland D. Prediction of visual field progression in glaucoma. Invest Ophthalmol Vis Sci. 2004 Dec. 45(12):4346-51. [Medline]. Sacca S, Marletta A, Pascotto A. Daily tonometric curves after cataract surgery. Br J Ophthalmol. 2001 Jan. 85(1):24-9. [Medline]. Shields MB. Reflections and projections on crossing the millennium: Tenth American Glaucoma Society Lecture honoring Marvin L. Sears, MD. J Glaucoma. 2001 Apr. 10(2):136-43. [Medline]. Pupillary block angle-closure glaucoma. Courtesy of the Ocular Imaging Center, New York Eye and Ear Infirmary. 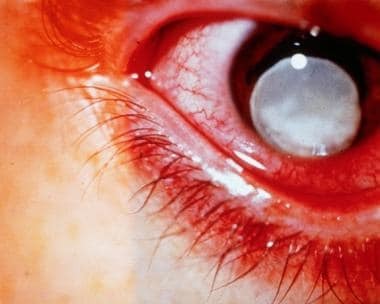 Hyphema. Deposition of RBCs in the anterior chamber. Disclosure: Received grant/research funds from Allergan for consulting; Received consulting fee from DRCR/National Eye Institute, NIH for consulting; Received grant/research funds from LUX, Inc for consulting; Received grant/research funds from DRCR/JAEB for none; Received consulting fee from ALIMERA for consulting; Received consulting fee from ALCON for consulting; Received consulting fee from GLAXOSMITHKLINE for consulting; Received consulting fee from QUARK PHARMACEUTICALS for consulting; Received consul for: santen.